» How to build your own External USB hard drive. After a recent crash that caused some loss of data (not Linux), I decided to look at the possibility of an external USB back-up drive, in order to back up on a more regular basis; I lost about a weeks worth of data plus some email records. The thinking behind it was to have a drive that would back-up from both Windows® and Linux machines and therefore, the file system had to be recognised by both systems. I already had a 250GB hard drive purchased recently for a different project that has been shelved and so it seemed the answer was to look at one of the many external cases, as a suitable build project. You need to be aware, not all cases are equal! There are cases that are specific to only IDE hard drives, or specific to SATA hard drives. Some will accommodate both types, but tend to be more expensive. You need to determine the hard drive size too. Is it “3.5”, the standard desktop size, or “2.5”, the laptop equivalent? Do you want data transfer at USB 1.0 speeds, USB 1.1 or USB 2.00? Looking at the specifications for each version will show that USB 1.0 provided data transfer rates of 1.5 Mbps (Mega bits per second), while version 1.1 offers 12 Mbps, and version 2.0, 480 Mbps. So really, it’s a no brainer as version 2.0 is backwards compatible with the others. It’s a nicely finished aluminium case, complete with its own power supply, mains kettle cable, USB connector cable, screw driver, four screws and a driver disc. Purchased via ebay for £9.98p delivered! How do they manufacture these things so cheaply? This part is only here for completeness, as depending on the case you purchase, things may vary slightly. Having said that, it seems most are fairly similar. The main criteria is to determine (assuming it’s an IDE drive) how to jumper it. You may know, a jumper(s) is used (or not) on the hard drive to set it as a Primary drive, Slave drive or Cable select. The jumper can also be used to limit the capacity of the drive for very old computers. As reports circulate around the Internet about incompatibility with various settings, I decided to tackle the problem as follows. Using the supplied screwdriver, I removed two screws on the side of the drive adjacent to the power end of the case; in other words, where the connectors were. The end then simply slides out from the case and you will see a tiny circuit board and the main data cable and power cable all attached to the front piece you have just removed. Look at the main case and on the underside there is provision for four screws via four holes. These will line up with the fixing holes for the drive. I decided to remove the jumper from the hard drive, thereby designating it as Slave. Now the next bit I did for my convenience and no way am I making a recommendation for you to follow suit, but in order to determine if the drive would be recognised in this form, I connected the front plate data connector and power connector to the raw drive. Making ”very” sure the components were not shorting out on anything, I fired it all up and had a look at the disk manager to see if it was recognised. As luck would have it, it was (more about that later – remember at the moment it’s still a new raw drive), so I stayed with that configuration, unmounted the drive and carefully powered off. Note: had the drive not been recognised at this point, it would have been a simple event to turn it off and try configuring it as a Master or even Cable select drive to see if that worked. It was now just a question of noting which way up the drive mounting screw holes were and when sliding the drive in the case, aligning them with the case, so the afore mentioned case holes married up. Next I used the supplied four screws to secure the drive in the case. All that remained, was to very carefully position the data and power cables so they laid nicely in the case and resecure the front panel with its two screws. So now I had an assembled external hard drive that I knew would be recognised in the Debian machine I was using, but of course, incapable at the moment of accepting data. Bingo! We’ve got it sorted! 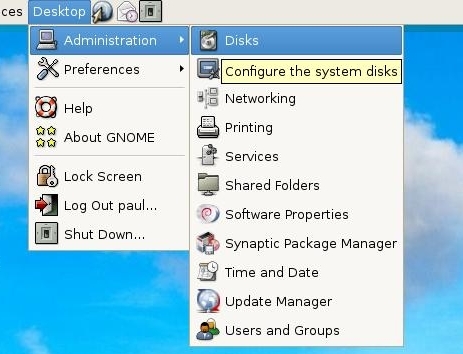 Alternatively of course, you could simply fire up Disks prior to connecting your new drive, note the drive(s) already found, then connect your new drive and see where it appears. Either way, the important information we require is on the Properties tab and if you refer back to that now, you will see the drive is designated as /dev/sde (just by the little drive icon). That’s the information we need to move forward. Shock, horror, it’s now time to move to the command line, so going to Applications >> Accessories >> Root terminal, will give us what we want. “Note to all users;” in the command boxes, #> represents the command prompt and is not part of the command. Any command typed, ”will not” be activated until enter is selected. The important part to note here, is towards the bottom of the screen-shot. Just above the bottom command prompt, there is a message that says; Disk /dev/sde doesn’t contain a valid partition table. This provides further confirmation, sde is the drive we have to work on. You can now see some warnings, that in general, it is safe to ignore. You can also see the command prompt has changed from what would be your own, to fdisks own prompt. fdisk works on a menu based system and now you are inside the system until you opt to exit. As you can see, typing m will offer help. so let’s try that and see what happens. You can now see the various options of this powerful application that are available to you. We need to create a new partition, so appropriately, the n command, sets this in motion. As I wanted a primary partition, I typed p and was then asked which number partition I wanted to create. Well, me being a logical sort of chap decided to start at 1 and so you see it typed here. Now fdisk wants to know where to position the partition on the drive (First cylinder); again I start at 1 and finally where I want it to end (Last cylinder). This last part deserves some explanation. 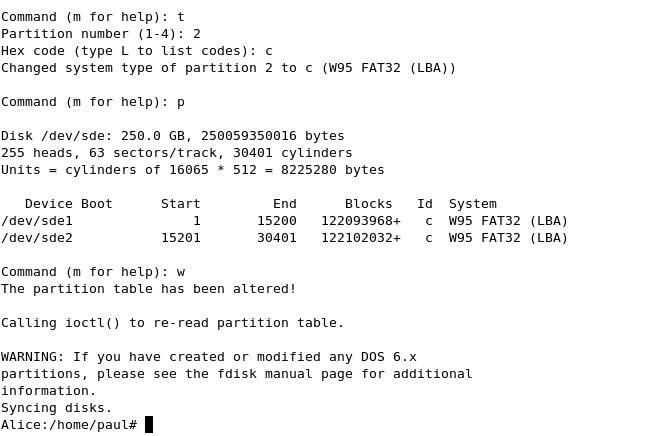 If I had typed in there 30401 as the last cylinder, fdisk would have used the whole of the drive as one large partition. However, it was my intention to split the drive into two equal parts, 15200 (more or less) divided it into two. Equally, I could have used the +size option, where for example, +125000M would equate to a 125GB partition. 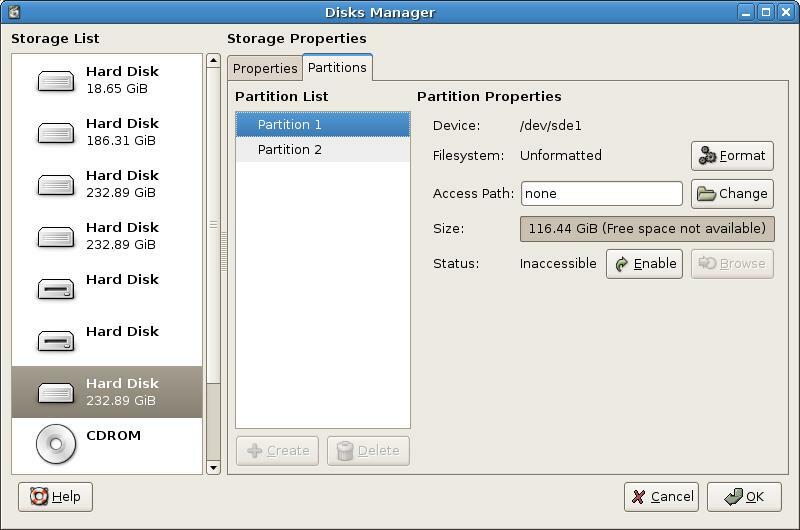 Notice, p now shows both partitions specified /dev/sde1 and /dev/sde2. 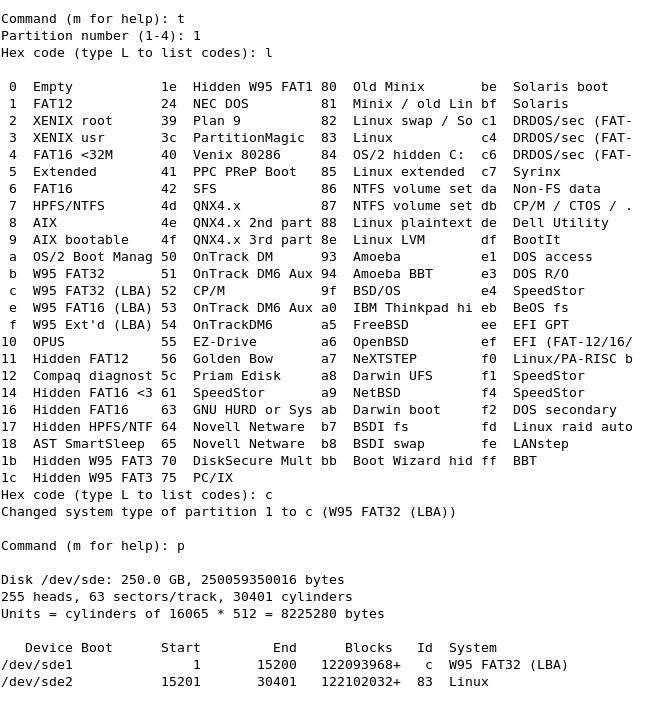 You should also understand, I used the word “specified” as the partition table has not yet been written to disk. We’ll get around to that soon. Now we need to do a little tidying up. 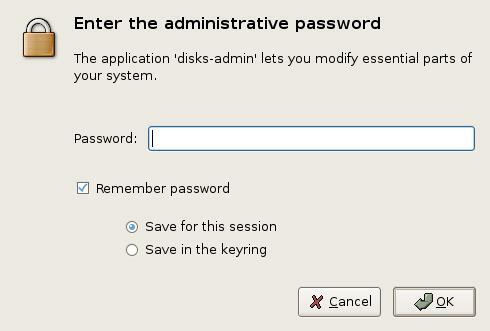 You may recall at the beginning of this page, I said this drive was to be suitable for “Windows® and Linux machines”. Notice the System block, has the file system listed as Linux. This is simply a file identification and has no bearing on what the final file system will be, but in order to avoid confusion, I changed it to FAT 32. This is how it’s done in fdisk. 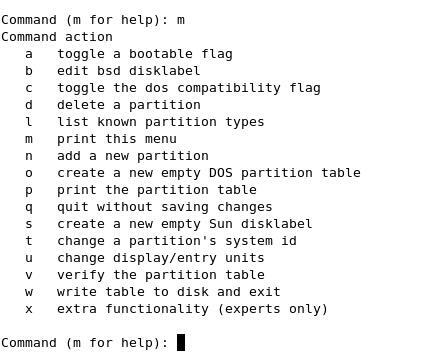 If you go back to the last but one screen-shot and take a look at the menu again, the t command allows you to change a partition’s system id. So the next screen-shot shows just that. 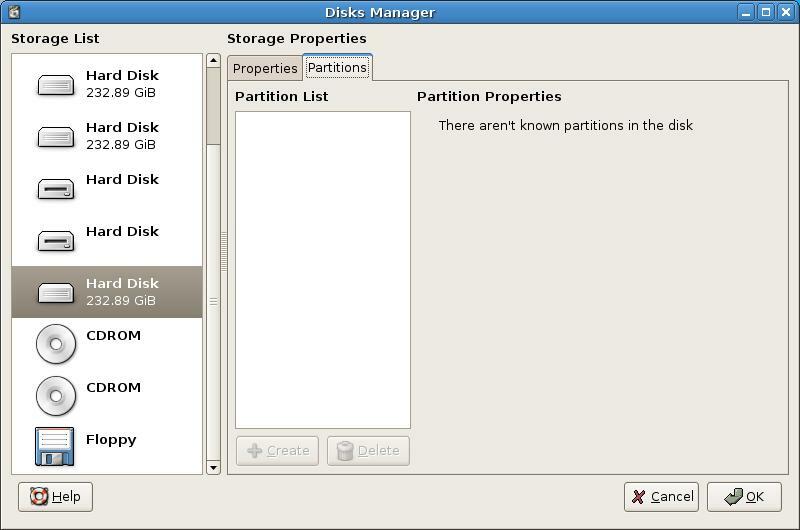 Selecting the command ”’p”’, confirms both partitions have had their ”’id’s”’ altered. You will now see; The partition table has been altered! and another couple of messages telling you what fdisk is doing. 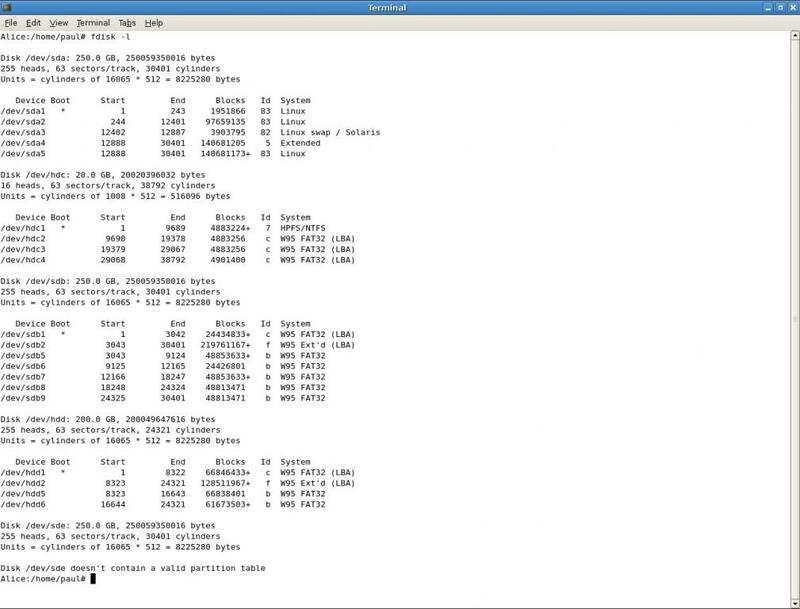 Now fdisk dumps you back at your own command line prompt. 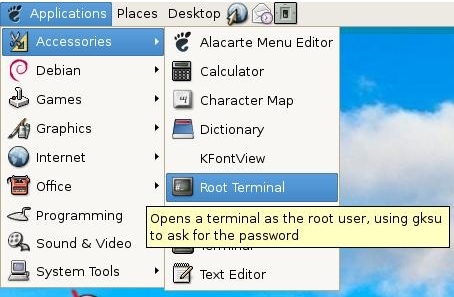 If you’ve finished with the terminal, type exit to close it. 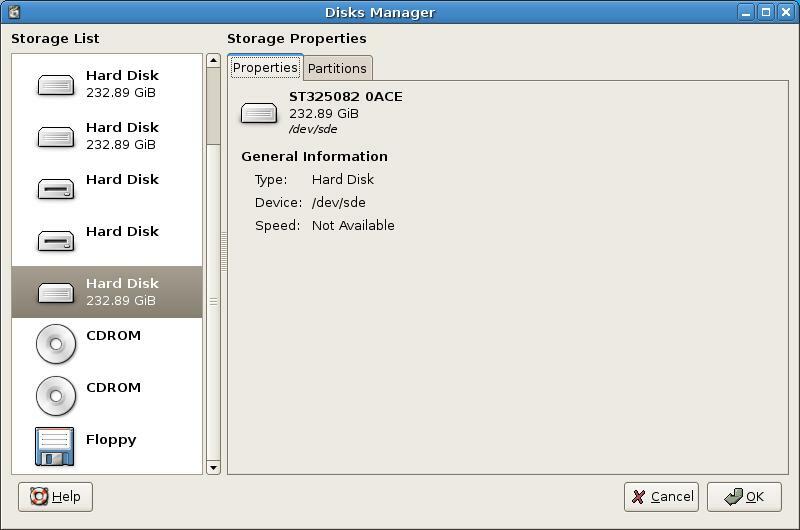 The easiest way to format the drive is via Disks manager (DM). You will remember we used that originally when assembling the drive to help identify which designation Linux had assigned. So go back into DM and take a look at your drives again. This time, we’ll see something rather different. Clicking on the Extended 2 drop-down list gives us four options: Extended 2; Extended 3; Windows Virtual FAT (vfat); Memory Swap. 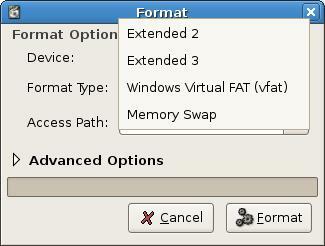 Clearly I needed Windows Virtual FAT (vfat) so that’s what I selected and then clicked on Format. As formatting destroys any data on the drive, you are given a final warning. Providing you are happy to commit, click on Yes. 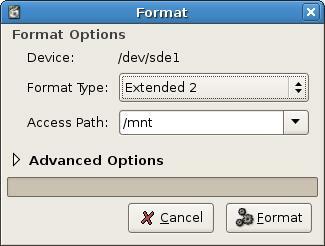 Formatting takes seconds in Linux, so almost immediately, you are taken back to the DM screen which has changed yet again. You can now see, to the left of the Format button, the Filesystem has changed from Unformatted to Windows Virtual FAT (vfat). I now repeated the procedure on Partition 2, and then shut DM. I have now tested this drive in Debian etch; Ubuntu 7.04; Linux Mint 4.0 Daryna; gOS; Windows ME; Windows 2000 Pro and Windows XP Home and it works flawlessly in each system. Sadly, PCLinuxOS 2007 has issues as does SuSE 10.2. You would think that with the Novel SuSE tie-up with Microsoft, FAT 32 recognition would not be a problem. But I suspect that is where the problem lays, as one of the systems reported it could not read the file system. Never-the-less, if you have an old working drive hanging around, this is an inexpensive way to utilise it.